Journeyman plumbers are skilled and experienced professionals who perform work assembling and installing pipe systems and fixtures in homes, businesses, and industrial buildings. A journeyman plumber is an individual who has fully completed an apprenticeship in the plumbing trade, and is qualified to work under a master plumber’s employ. A journeyman’s license is earned through a process of taking educational courses, conducting work experience under another’s supervision, and passing a test to prove aptitude. Journeyman plumber exams are state-specific tests used to assess an individual’s abilities, and to determine whether an individual possesses the skills and knowledge that a state requires to work as a certified plumber at the journeyman level. To help you pass your Journeyman Plumbing Exam on the first try, we suggest the comprehensive Journeyman Plumber Practice Exam with 320 Journeyman Plumber Questions, a 50 State Plumbing License Guide and more. Prior to taking a state administered exam, many states require a candidate to have worked about four to five years under the supervision of a master plumber. 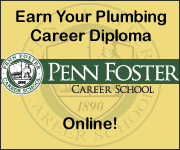 After completing apprenticeship requirements, and passing the journeyman exam, an individual is considered an experienced plumber who is skilled in his or her craft. The title journeyman signifies that a plumber is capable of performing the duties of an experienced plumber, but plumbers at the journeymen level typically do not manage projects or supervise employees and tend to make less money than master plumbers (see Master Plumber Guide for salary comparison and additional information).